Employees angry over alleged mistreatment by security guards threw rocks and damaged a gate of a Taiwanese garment factory at a protest Saturday, police and union officials said. About 50 of the 700 workers protesting at the Gold Kamvimex garment factory on Pochentong Boulevard broke through the front gate when they weren’t allowed into the building. They hurled rocks at buildings in the compound, breaking several windows, Dangkao district police Chief Mom Savath said. There were no arrests and no injuries. Mom Savath said police did not intervene and the demonstrators finally went home. 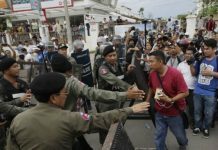 According to a spokesman for the Free Trade Union of the Workers of the Kingdom of Cambodia, Kamvimex workers had complained that company guards on Friday were walking around with grenades and had fired a pistol into the air to frighten them. Employees unsuccessfully demanded an apology from the guards, the spokesman said. Factory management could not be reached for comment. The factory will remain closed until Friday, when managers will meet with officials from the Ministry of Social Affairs, Labor and Veterans Affairs to discuss problems at the factory, police and government officials said. The riot at Gold Kamvimex is the latest in a series of disputes at city factories—most of them garment companies—and comes less than one month after a protest at another Taiwanese-owned garment factory turned violent. Meanwhile, an inter-ministerial commission set up to deal with labor disputes met for the first time Friday, said commission member and Industry Undersecretary of State Hul Lim.